When our girls were younger, they had a construction set of magnetic balls and sticks they loved creating with. I don’t recall the brand, but recall that there were a number of them on the shelves of our Walmart. We’ve even picked up extras when we found them during a trip to a Goodwill Outlet. A couple weeks ago at our local Goodwill we came across a board game that utilized these same pieces to create a chess-like experience. 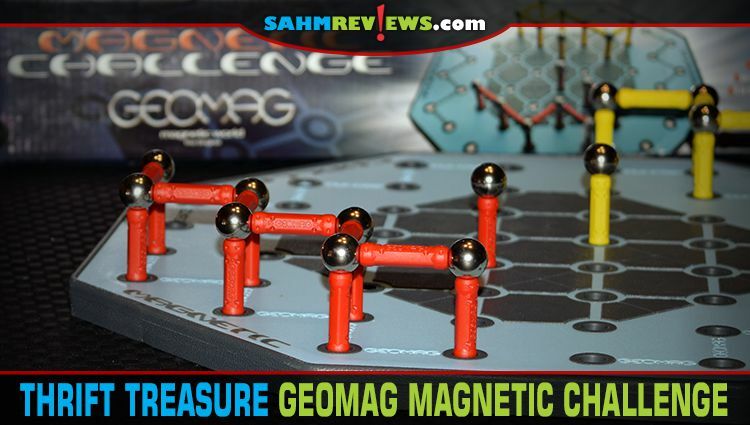 Geomag Magnetic Challenge was originally published in 2004 and appears to have been more widely distributed in Europe. This makes sense considering it was made in Switzerland and the shipping costs would be quite high due to the weight of the game. We don’t know how far this copy traveled, but it was complete and in like-new condition. Definitely worth the $3.88 asking price! 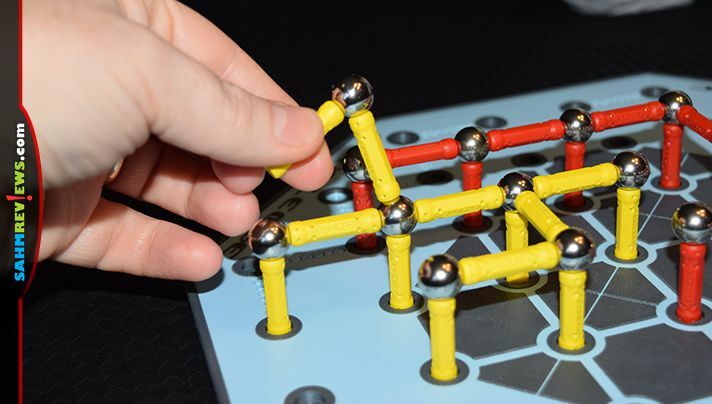 Geomag Magnetic Challenge is a head-to-head game where two players are trying to get their snake of attached pieces to the other side of the board before their opponent does the same. Your snake can never be broken apart and has a limited number of movements it can make on a turn. When you move a section of your snake, you may either move a piece from the first layer from one hole to another or move pieces on the second layer twice. Moving a first layer peg must be completed without any pieces falling and the end result must have the parts making 90 degree angles to the board. Parts of the snake may also be lifted onto a second level, allowing them to walk along the back of your magnetic reptile. A maximum of one sphere and two attached pieces may be on the second level and must make their way back to the board before other pieces may climb up. As mentioned previously, your snake may never break apart and must remain whole at all times. 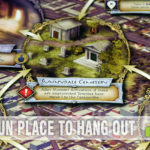 Additionally, it may not connect to the opponent’s snake or either of the two “Joker” pieces (single peg/sphere combos in the center of the board). 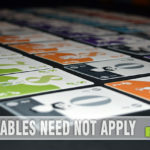 Each player owns one of the jokers and are used to block the movement of their opponent’s snake. 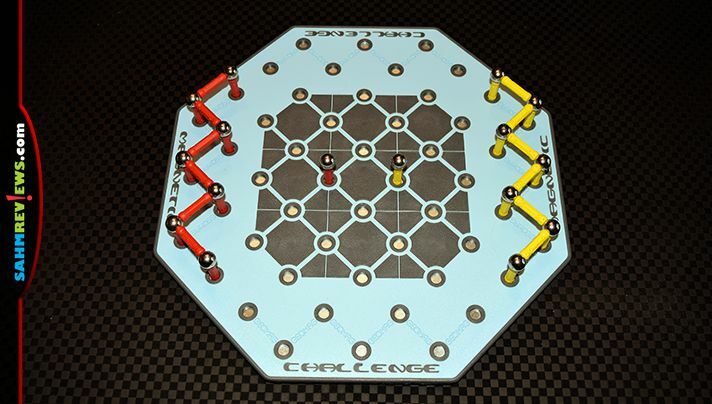 When you get your snake to the same horizontal line your joker exists on, you may move it to any open space in the center of the board to inhibit the movement of the other player. If you don’t wish to move your joker, you may instead move an extra first level segment one time or a second level segment three times! 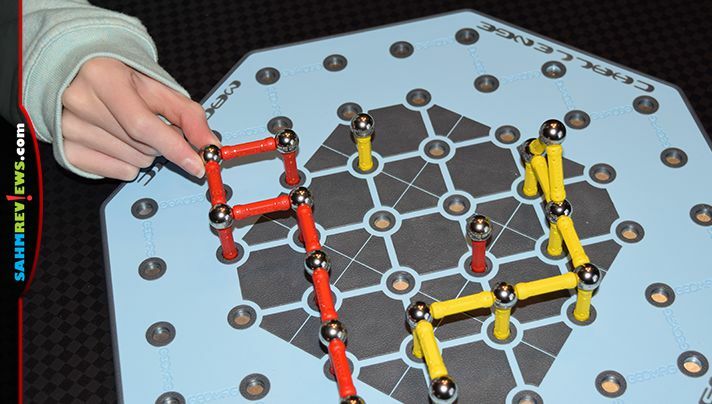 The snakes will wriggle across the board, sliding past each other until one of the snakes takes up residence in the starting location of the other player (think of Chinese Checkers where you get your marbles into the other person’s starting area). 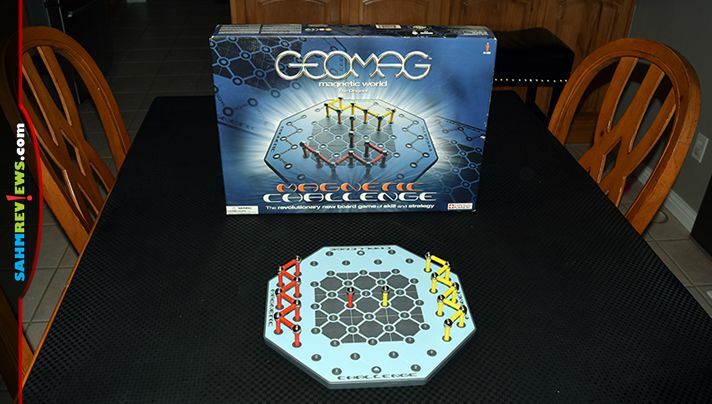 The first person to get their snake all the way into the other player’s area wins Geomag Magnetic Challenge! 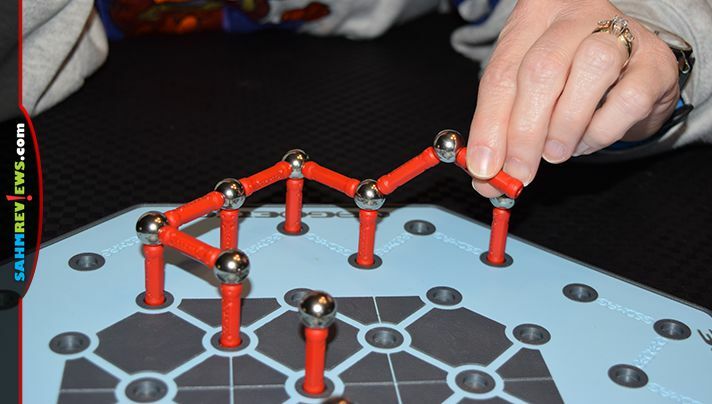 Geomag Magnetic Challenge doesn’t appear to be currently available at retail, but there are a number of copies on eBay for a wide range of prices. From looking at the history it appears to trade hands at around $40 shipped, so don’t fall for the inflated prices asked by some sellers. 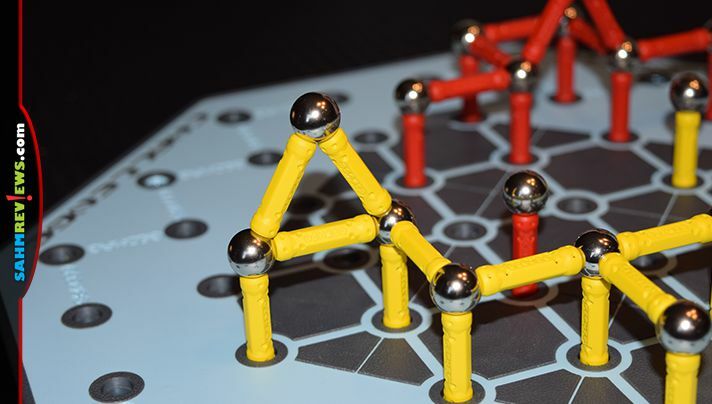 If you have some of the other construction kits by Geomag, you could probably fashion the game using spare parts! 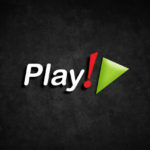 What is your favorite game that uses magnets? I got some desk toys that look kind of like those pieces! 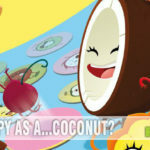 I’d love to get this game just because I already love playing with them already!